In 2014, DGA began working with the Retail Industry Leaders Association (RILA)—a trade association of the world’s largest and most innovative retail companies—to create and support its Energy Management Program, which seeks to transform the retail industry by guiding retailers to energy, carbon, and cost reductions across their building portfolios. At the beginning of the partnership, DGA helped facilitate steering committee meetings, develop a successful funding strategy, and author a series of case studies. 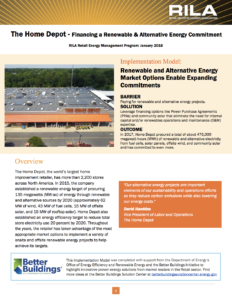 As the program has matured, DGA continues to provide research and strategy support and develops clean energy implementation case studies, such as those featuring Best Buy and the Home Depot. RILA has continued to benefit from DGA’s expertise since the launch of the program. In 2017, DGA provided strategic guidance, subject matter expertise, and support to RILA as they developed the Corporate Clean Energy Procurement Index, which is intended to assist policymakers and large clean energy buyers in advancing policies that help, not hinder, renewable energy development, and help large buyers to select states in which they may make renewable energy investments. DGA’s expertise in facilitating and managing multi-stakeholder projects, advising Fortune 500 companies on sustainability, and communicating a deep understanding of low-carbon strategies for commercial buildings contributed to the continued success of this partnership.